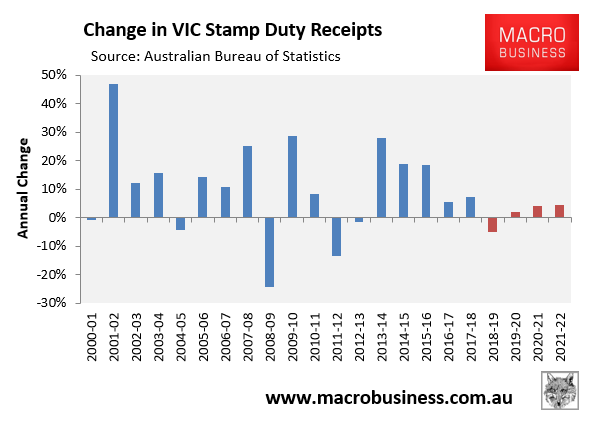 Australian states’ mid-year reviews (MYRs) reveal that revenue pressures from the housing market correction will partly offset gains from the Government of Australia’s (the Commonwealth, Aaa stable) Goods and Services Tax (GST) funding reform – all while debt levels remain elevated. At the same time, we expect higher-than-budgeted capital spending to become a major challenge for states as most embark on record capital spending programs, causing debt to rise more rapidly than revenue. While for some states, debt will start rising from a lower level than in earlier budget projections, overall debt burdens will remain elevated over the next four years, increasing vulnerability to risks such as unbudgeted health and education reform costs. Housing correction will partly erode revenue gains from GST reform. Additional GST top-up payments underpin a strengthening in average revenue growth to 2.7% over the forecast period of FY2019 (fiscal year ending 30 June 2019) through FY2022 in the MYRs, compared to 2.6% in the 2019 budgets. However, a weaker housing market will offset these gains. 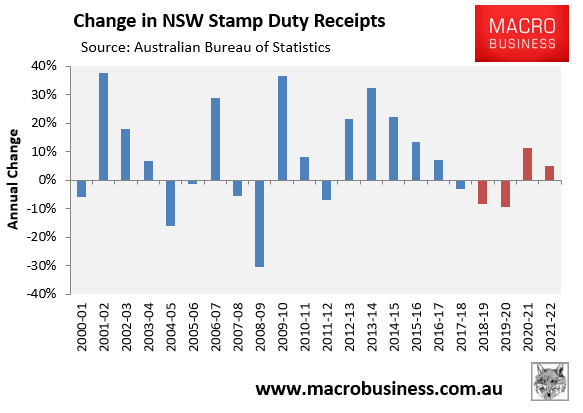 Despite already projecting lower property-related revenue in their FY2019 budgets, the larger states of New South Wales (NSW, Aaa stable) and Victoria (Aaa stable) now forecast further declines in transfer duty and land tax revenue as a result of weakening residential property market prices and falling sales volumes. Capital spending projections rise again, could increase further. Overall infrastructure spending projections increased by AUD3.6 billion ($2.5 billion) or around 2% over previous estimates, largely driven by NSW’s AUD2.7 billion increase. This spending primarily targets transport, road and rail infrastructure to support population growth. We see scope for capital spending to increase materially above MYR forecasts in some states given ongoing population growth. Debt burdens will be higher than originally projected. Higher capital spending will erode cash reserves accumulated by some states from asset sales and leasing programs, and prompt them to issue additional debt. Although projected debt levels are broadly manageable, further sustained increases in debt combined with narrowing operating margins would weaken states’ credit profiles. States are vulnerable to cost pressures in education and health. We expect that states will face rising costs for education and health over the forward estimates, which could erode fiscal balances and operating margins for some. This vulnerability will be higher for larger states such as NSW and Victoria, as well as Queensland (Aa1 stable), which has recently experienced rapid population growth. 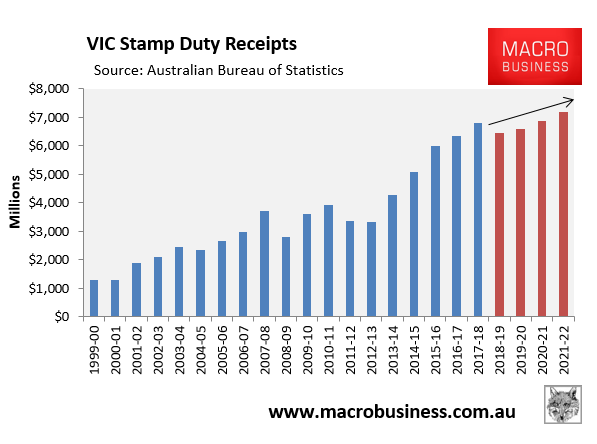 As the property market deteriorates further, this inevitably means that stamp duty receipts will be smashed, wiping billions in revenue a year from the respective state budgets. 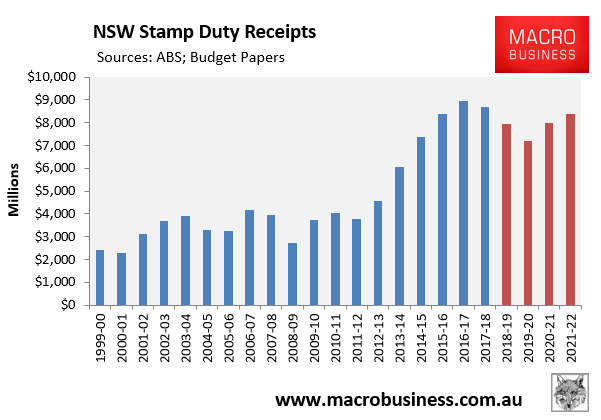 Thus, both the Victorian and NSW Budgets are facing possible meltdowns as crashing stamp duty receipts meet massive population-related spending commitments. This could then crimp infrastructure and public spending as austerity arrives.